I am working on a guest room redesign and needed two matching lamps to top two nightstands. 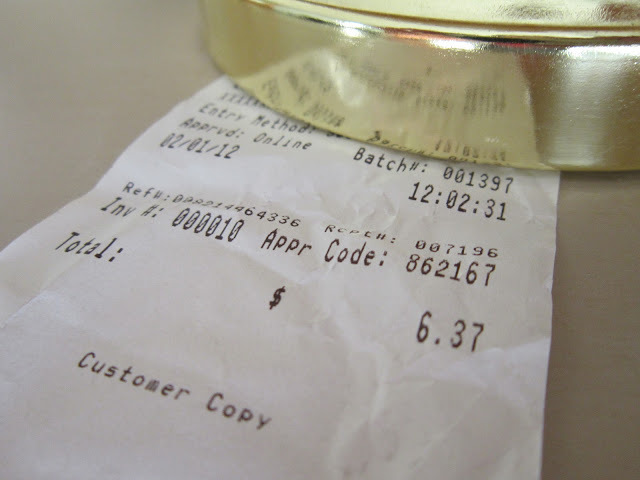 The budget on this project is very small so I've been scanning thrift shops and discount stores to find my materials. 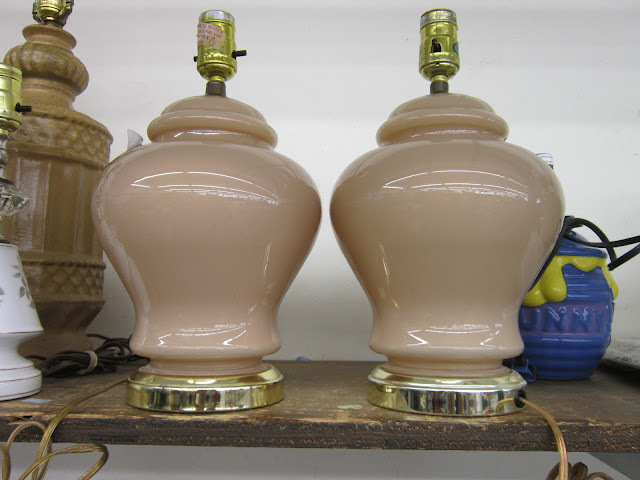 When I saw these Ginger Jar lamps for $6.37 I grabbed them! They needed a new color, the brassy colored base needed toning down and they didn't come with shades but you can't go wrong for six bucks! 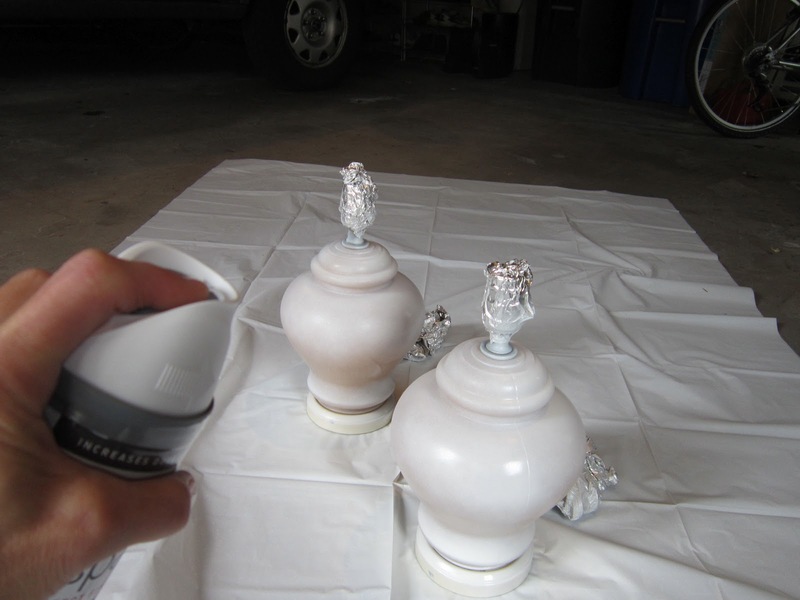 The first step was to spray the lamps with a quick coat of primer. 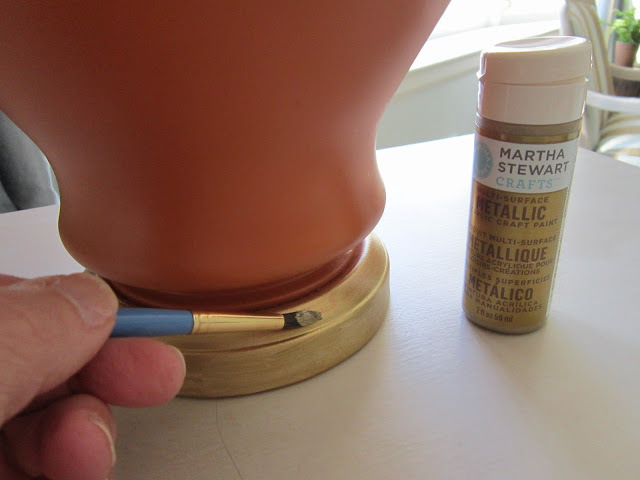 The shiny surface needed to be primed in order for the paint to adhere to the surface. 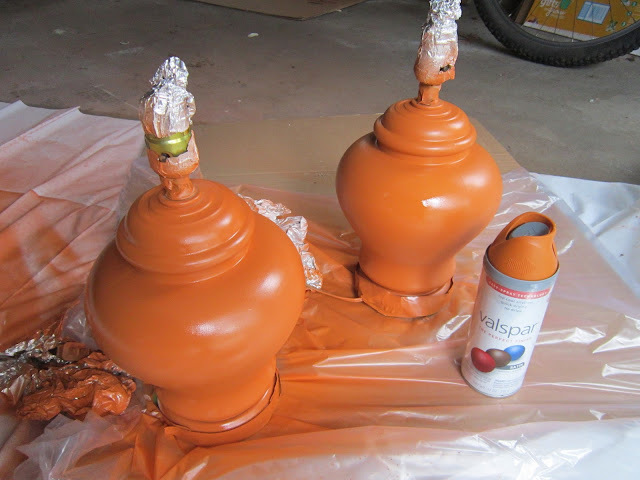 Next came the paint...the orange color works with the curtain panels I chose for the room. For the bases, I brushed on Martha Stewart's Gold Metallic craft paint. It has a beautiful gold sheen, not brassy at all. ... so while I was shopping at Wal-Mart I also picked up three colors of yarn. I was inspired by this Ombre lamp shade that I found on Pinterest (from Mandi at Vintage Revivals). 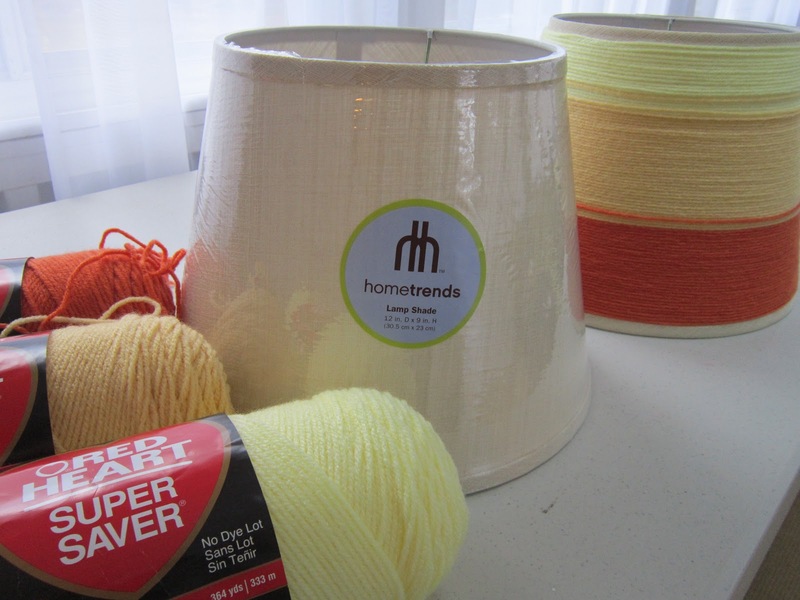 It's so easy--just keep wrapping the yarn around the shade using a bit of glue from a hot glue gun to keep the yarn in place. (I found that this works better using as little glue as possible). 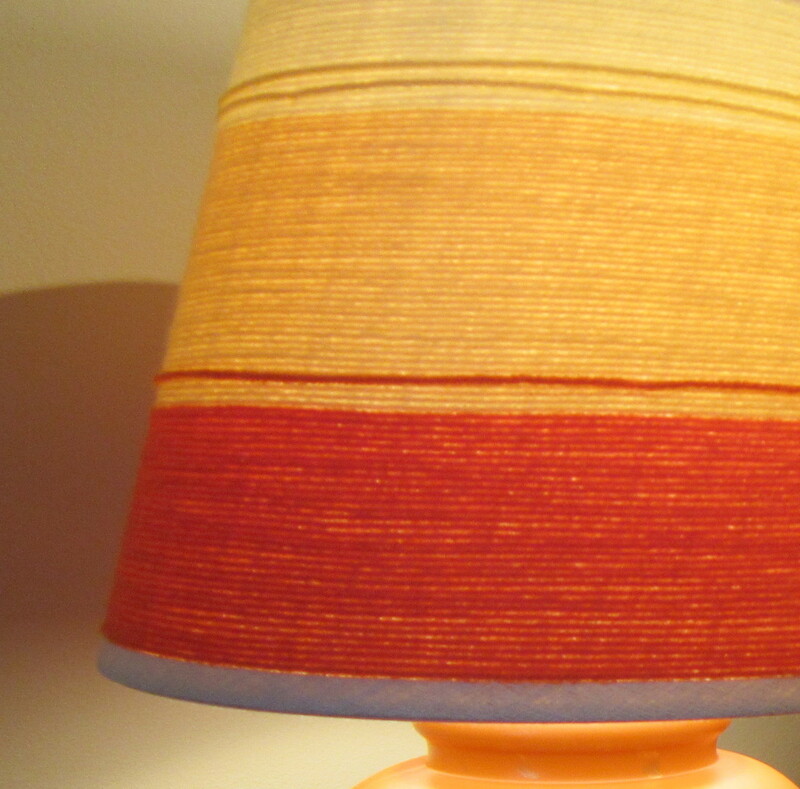 Ombre (which is color that is shaded or graduated in tone) is so hot right now in home design! I've seen the same idea used in painted chests of drawers, and even walls painted with an Ombre treatment. 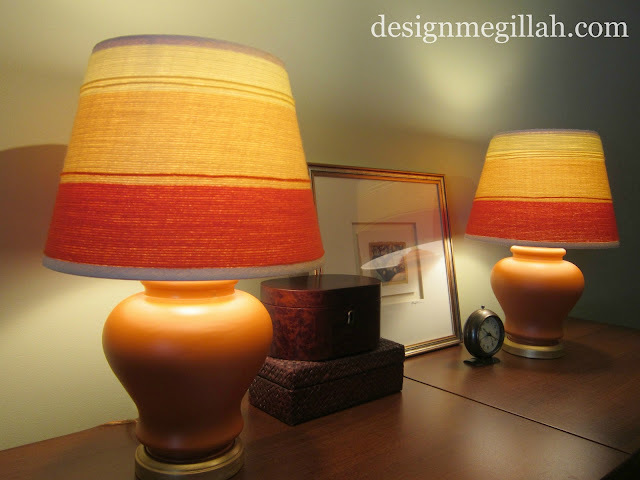 This is not the permanent home for the lamps--I'm still finishing up the guest room so I put them in my son's room to show you how they turned out. Quite a transformation, right? What a great transformation! You'd never guess what they used to look like. Thank you--it was easy and cheap, too! Wow, they look so much better now that you spray painted them. I love the color you chose! great job! thanks so much for sharing on Craft Schooling Sunday and can't wait to see them in their real home! Rita, these are truly amazing! I'm in love with the way you made over those thrift store lamps. Thanks so much for sharing. And happy Blogiversary!!! Thanks Brittany--for all your support! Stopped over from Pretty Handy Girl...love the lamps. They are gorgeous. Thank you and thanks for writing!